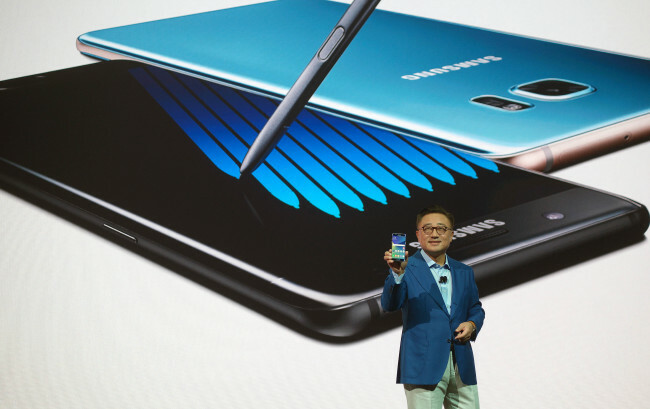 [THE INVESTOR] Samsung Electronics is considering a recall on its latest smartphone Galaxy Note 7 after a series of explosion reports possibly due to faulty batteries. Since its Aug. 19 launch, some 400,000 units of the phone have been sold in Korea alone. According to industry sources on Sept. 1, the Korean tech giant plans to announce a more detailed recall plan, including free battery exchange, on Sept. 2. The company is reportedly not considering refunds or exchange with a new phone. There have been several reports in Korea and abroad that the big-screen Note phone exploded while charging. No injuries have been reported. Samsung, which has suspended the phone’s shipments since early this week, has tentatively concluded that the faulty batteries may have caused the accidents. Samsung SDI, the battery supplier, produces the battery cell, while outsourcing the battery pack production to other firms. The defective batteries used in the phones sold in Korea and some markets were produced by a local battery maker ITM Semiconductor. The recall plan comes after Samsung executives, including mobile chief Koh Dong-jin, gathered at the company’s smartphone plant in Gumi, North Gyeongsang Province, to discuss countermeasures. After the upbeat sales of the flagship Galaxy S7 in the first half, Samsung was pinning high hopes on the Note phone to take on Apple’s upcoming iPhone launch in the coming months.